The villa with a size of 150 m2 consists of four bedrooms upstairs, three with double beds, one with a bunk bed and two single beds, two bathrooms (shower and bath), two separate toilets (one per floor). The ground floor has a very spacious and light-filled living and dining room with several comfortable seats, a fireplace, three sofas, a television and a spacious and comfortable kitchen with another small seat. From the conservatory and the kitchen you step on the stone terrace with a southwest-facing seat, which can be protected by an out mobile awning from the sun. The 800 meters comprehensive, well-laid out and by a high hedge completely secluded garden has a variety of uses. 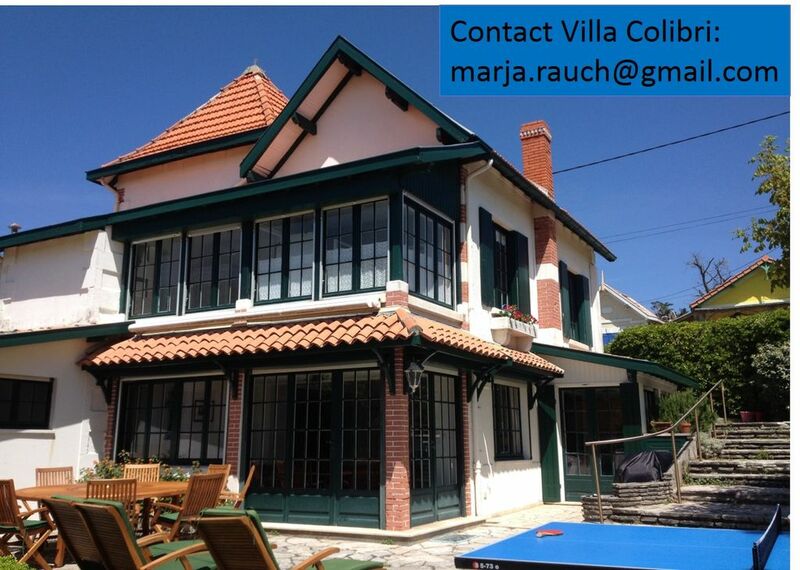 It is equipped with deck chairs, a hammock, a table tennis and soccer goals, you can read, Boule and Viking chess etc. The property is well suited for a large family or for two families holidaying together. The Villa is located in a quiet area in the patriarchalist part of Lacanau and is surrounded by very beautiful villas from the Belle Epoque. Because of the central position (100 meters to the supermarket, bakers, butchers, fishermen, the indoor market, 200 meters to the beach), everything is in reach by foot. The house is charming in summer by the smooth transition from the living room and terrace. In all other seasons it shows its sunny side: The cozy fireplace seating invites you to linger, in the cold season, the central heating for added comfort. The long sandy beaches of fine white sand delight every holiday and the Atlantic offers daily a different vision. Surfing, bodyboarding, simply dive through the waves or enjoy beach - everything is possible. The nearby lakes, the Lac de Lacanau (7 km) and the Lac de Hourtin in Maubuisson (13 km), with their wide sandy beaches a quieter alternative for swimming, sailing, windsurfing and canoeing. Numerous biking and hiking trails allow excursions through the pine forests and access to the dunes and secluded beaches. Also Golf lovers will find in Lacanau maintained golf courses. Excursions to the World Heritage city of Bordeaux, the wine châteaux of the Medoc, the dune of Pila or the Gironde estuary are of Lacanau from each with about one hour driving time trouble and round off the holiday. Une maison vraiment charmante dans laquelle on se sent bien, équipée de tout le confort nécessaire, un superbe jardin très agréable avec tout l'équipement également. On entend l'océan depuis la maison et c'est vraiment agréable. Nous avons passé un agréable séjour, la maison est très fonctionnelle et à deux pas du centre de Lacanau-Océan et des plages ! Très belle maison traditionnelle canaulaise en plein centre ville. la voiture est resté au garage tout le séjour ! Bref de supers vacances ! In diesem liebevoll und sehr stilvoll eingerichteten Haus haben wir wundervolle Ferien verbracht. Haus und Garten sind ebenso perfekt wie die Lage - ganz zentral und doch völlig ruhig. Das Haus ist sehr gepflegt, der Kontakt mit der Vermieterin sehr einfach. Wir kommen gerne wieder. Charmantes Haus, sehr gute Lage direkt im Ort, alles in kurzer Distanz zu erreichen - trotzdem sehr ruhig in einer Nebenstrasse. Grosser, schöner Garten, geschützt und herrlich besonnt. Hohe, freundliche Schlafräume, grosszügiges Haus, liebevoll eingerichtet im Stil des Hauses. Wir haben uns sehr wohl gefühlt, perfekt auch für Kinder. Gut organisiert mit Hausservice für die Übergabe / Rücknahme des Hauses vor Ort. Können wir jederzeit weiter empfehlen!! Vielen Dank für die nette Bewertung, wir freuen uns, dass alles gut gepasst hat und wären glücklich, wenn Sie wiederkommen würden! Très belle maison, agréable et spacieuse. Bien située, à proximité des commerces et de la plage. Grand jardin, très agréable notamment avec des enfants. Espace extérieur avec table et transats très pratique et de bonne qualité. Nous avons passé d'excellentes vacances! Nous reviendrons avec plaisir! Merci pour cette appréciation, c'est avec grand plaisir que nous vous accueillerons de nouveau. The villa is located in a quiet area in the oldest part Lacanaus and is surrounded by very beautiful villas from the Belle Epoque. The central location (100 meters to the supermarket, bakers, butchers, fishermen, the indoor market, 200 meters to the beach) everything can be achieved wonderfully relaxed walk. Es können Fahrräder gemietet werden./ On peut louer des vélos.